The Journal of Peace Research recently devoted a special issue to the work of researchers studying the linkages between climate change and conflict. Special guest editor Nils Petter Gleditsch introduces the issue here. The relationship between climate change and conflict has been discussed for over two decades but most of the evidence of the link between the two has been anecdotal, drawing on extreme climate scenarios. 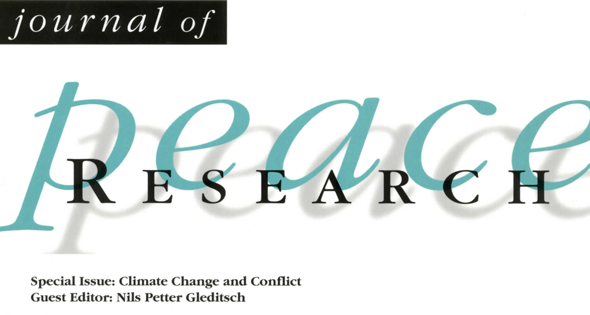 The authors featured in the January special issue of the Journal of Peace Research devoted to climate change and conflict are therefore to be commended for their detailed investigations into a possible causal relationship between the two. While many of the articles in the special issue focus on sub-Saharan Africa and the link between drought and climate, there is also much interest here in Canada about the potential impacts of melting sea ice in the North and its implications for security. My first analysis of the link between climate change and conflict was stimulated by a call from the Canadian Department of National Defense, way back in 1989. The issue has been on the minds of both researchers and governments in many countries for a long time. My concern with both the anecdotal prognostications and many of the articles in the special issue is that the complexity of climate change is not taken into account. Most authors note the concern with climate variability and conflict (e.g., Hendrix and Salehyan) or assume that climate change will have a negative impact on economic development, which will, in turn, promote conflict (e.g., Devitt and Tol). These seem like reasonable concerns/assumptions, but they still ignore the limited knowledge we have of how climate change will manifest itself at national and sub-national levels as well as the context in which climate change and variability will occur. As much as I support investigations into the quantitative links between climate change and conflict, they are not able to adequately depict the drivers or intermediate variables and their results, and therefore must be questioned. Climate change is an incredibly complex phenomenon, and this is one reason, I feel, why the general public has failed to grasp the importance of the issue. The general circulation models of global climate – of which there are only half a dozen – provide relatively consistent projections of the increase in average global temperatures that will occur under a doubling of CO2 in the atmosphere (or other levels of CO2, but a doubling is generally the level that is used). At the very least they are consistent in projecting an increase; the amount of increase varies by model. The models’ projections of global precipitation changes, however, are quite inconsistent, with some showing an increase and others showing a decrease. As one moves to smaller spatial scales – even in large regions, such as sub-Saharan Africa – the variability in the projections becomes greater. These are models of the global atmosphere, and while work is ongoing to look at the regional scale, reasonable (in terms of consistency) projections are still a few years away. A second and equally important issue is that while the models can project average global temperature and precipitations changes (and other variables, such as soil moisture), most analysts realize that the greatest impacts on society and the natural environment are likely to occur from the increasing magnitude and frequency of extreme events. In other words, the variability in climate that is likely to accompany global warming. The models are not good at projecting climate variability, and yet if there is an impact on conflict, it is likely to be the result of this variability. How can we estimate the link between climate change and variability when we have such a poor understanding of what this variability will be? Third, much of the early work on climate change impacts was limited to assuming a linear relationship between climate and a variable – agricultural output, for example – without considering the structural context of these potential impacts. This was a major flaw in the early studies that resulted in an oversimplification of how climate change might impact society. Two examples might suffice: McLeman and Smit (2004) investigated the role of climate (in particular, drought) in the migration of workers from the “Dust Bowl” of the southern United States to California during the 1930s. They concluded that overcapitalization in agriculture, land-tenure relationships, and changing technology were the main causes of the migration. Climate was a trigger, but the migration would have occurred anyway. A second example is the havoc caused by Hurricane Katrina in New Orleans. This was much less a climate issue than it was one of failing infrastructure and poor land-use/development policies. Yes, climate was a trigger, but how do we then model the role of climate in the changes that ensued? Like conflict, climate change is a complex phenomenon that, while understood at the global level, is difficult to assess at lower spatial scales, let alone within the context of a myriad of other factors that affect human security and armed conflict. Further responses from the environment and security community on the special issue can be found here. If you’re interested in weighing in please feel free in the comments below. Steve Lonergan is a professor emeritus in geography at the University of Victoria and a former director of the Division of Early Warning and Assessment at UNEP. He specializes in water resource management issues in the Middle East and the impacts of climate change.